Hey everyone! Since its the beginning of the year I thought I’d update everyone on the books, TV shows, and movies coming out this year that are on my radar. I’ll see how many of these I can catch (and possibly write about) through the year and I’ll come back to this post in December and see how much I accomplished. Some of these I’ve been looking forward to for quite a while, others I just discovered in my search for new things coming out this year. Either way, here’s my list and I hope you find something that interests you! If you have something I should add to my list, let me know in the comments! It would be a very long post if I introduced each item on here, so I decided to just list their names and release dates for now. Links lead to the trailers for the movies and shows. If there’s no link, that means the trailer isn’t out yet. Doctor Who series 12 doesn’t look like it will be coming out until 2020. I feel like my TV shows list is kinda small, though of course I’m not counting the shows that are not coming out this year or that are releasing new seasons but I haven’t seen the previous seasons yet. If you have anything else you think I should be interested in, mention it in the comments and I shall be eternally grateful (I feel since I mentioned Toy Story I had to say that). Disney’s “The Lone Ranger”, released in 2013, did poorly at the box office and with critics, and currently has a rating of 31% on Rotten Tomatoes. The overall consensus on this movie was that it was poorly written, overdone, and slapstick. Critics on the site said the film was too long, that Johnny Depp should not have been cast in a Native American role, and that Armie Hammer’s John Reid was a weak and useless protagonist, especially when paired with the forceful personality of Depp’s Tonto. I recently watched the movie again (twice in a row) with my family and wanted to submit my personal opinion, which is the exact opposite. I think this movie is absolutely genius, and has become one of my favorite movies of all time. If you haven’t seen the movie, be warned, there are spoilers, but you’ve had plenty of time to watch it since it came out. I looked for articles online and it seems like so many people hated this film that there are few defenders of it, though this review gave it a fair pass. I cannot say I have answers to all the critics’ critiques (pun intended), but a lot of their issues seem to be more with the movie politics than the story and its effect on its audience, so instead I will just focus on my list of what I loved from a fan’s point of view. Let’s start with the smaller points and work up to the bigger ones. The inclusion of this horse is probably one of the biggest reasons critics call it overcomedic. The animal is seen multiple times throughout the film doing things that no self-respecting horse would ever do and appearing places no horse should be able to reach – standing on the roof of a burning barn, drinking beer out of an open bottle, standing on a tree branch wearing a hat, etc. 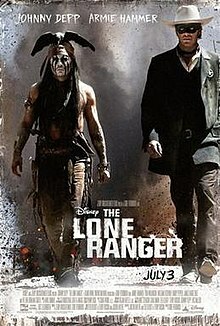 Additionally, Depp’s Tonto (though admittedly we must take this with a grain of salt) claims that the horse told him that Reid is a “spirit walker” and therefore cannot be killed, giving the doubtful ranger the confidence to take the shot with his silver bullet at the climax of the movie. However, the horse was genuinely helpful, always seeming to magically appear whenever (and wherever) it was needed. While some might say that the horse was unnecessary, I say that as a western comedy (which this movie absolutely was), it is essential to the comedic property. Come on, tell me when you watched this you didn’t at least laugh once at the beast’s increasingly improbable activities! We can all confidently say with Tonto, “Something definitely wrong with that horse!”. This one is pretty funny. From the very first scene they have together, Tonto doesn’t like John. Instead, he sets his sights on John’s brother, Dan, whom he sees as a “great warrior”. When both Dan and John get shot in the canyon with the rest of their party, Tonto comes to bury them. While he’s there, the horse shows up and starts stamping the ground near John’s grave, indicating to Tonto that John is the spirit walker. Tonto, obviously not liking this very much, starts trying to lead the horse over to Dan’s grave. He tells the horse that Dan is the “strong brother”, and that John is an idiot. But the horse is insistent, and Tonto is stuck with John for the rest of the film. The thing that makes this really funny, however, is that it gets brought up again and again. Tonto starts calling John, “kemosabe”, which drives John crazy until he finally asks what it means. Tonto looks straight ahead and says, “Wrong brother.” After that, it becomes kind of an in-joke for the remainder of the movie, but it’s that moment that my family and I still quote all the time. This reason is a little more somber in nature. The dead bird (no, not dead; “awaiting spirit to return – not same thing”) Tonto wears on his head signifies a much deeper tragedy that turned Tonto into the character he is in this movie. It’s what “killed” Tonto the Comanche and gave birth to the wandering, crazed Wendigo hunter in search of revenge for what happened to his village. He blames himself for being so easily betrayed for the sake of a trinket, which is why he still carries the bird. I believe the bird represents the Comanche in general. Several times throughout the movie you can catch a glimpse of a live bird, especially around Tonto, seeming to imply that it is the same bird even though the audience knows it’s a stiff mannequin atop Tonto’s head – a kind of symbolic reference, which parallells the Comanche chief telling John Reid, “We are already dead”. At that time in American history, Indians of all tribes were being killed or driven out of their lands, forced to give up their identity and their way of life. Tonto’s constant expectation that the bird’s spirit would return seems to communicate that he still hopes his people could be great again. At the same time, just as I believe the bird represents the Comanche, the pocket watch represents the opposite, namely the greed of the white men in this story. The fact that Latham Cole and Butch Cavendish were willing to slaughter an entire village of innocent people for a river full of silver all to themselves gives a grave warning to all viewers about the devastation of the sin of greed. This potent symbolism in the movie’s storytelling is, in my opinion, a huge point in its favor. I personally love to analyze stories and it’s gratifying when there’s more beneath the surface than appears at first glance. Though the movie is a comedy, this genuinely serious undercurrent is what gives the movie weight. Back to the non-serious, it’s Johnny Depp! One of the weirdest actors in Hollywood but genuinely fun to watch. I have no problem that he played Tonto because this particular Tonto is a parody of a Native American character, not a true one. He’s designed not to represent the Comache in general, but to represent “the one who lost his way”. His character is so wacky, it does nothing to appropriate Comanche culture in any way as far as I can see, because the character isn’t written to represent Comanche culture. The audience knows this going in because of the particular style of the movie, so it’s very unlikely that Depp’s Tonto would be turned into a stereotype. Plus, the movie isn’t big on historical accuracy anyway because that’s not the focus. So, I think Johnny Depp was a great pick for this role because of the hilarious way he portrays the insane Indian, from the whole “spirit walker” thing to catching the grape in his mouth to the ladder incident on the train (Pirates of the Caribbean anyone?). And those facial expressions? I could watch this guy all day. I had to put this in here. I just had to. We laugh so hard at this scene every time we watch the movie. I wish GIFs had sound so you could hear just how high-pitched the sound he makes is! Because it’s just a momentary funny and not a whole scene, I almost ruled out putting it as a reason. But every time I watch this movie, I look forward to this moment. Coupled with where they are in the scene (“You’re lost, aren’t you? Train tracks? I thought you were in Indian Territory.”) and the switching between Ancient Tonto in the museum and the rest of the story, that part of the movie is also critical to the main plot. And they managed to slip that girly scream in there in such a way that it’s very funny without disturbing the momentum of the story. I appreciate that. This is one of my most favorites – where it starts getting really deep. You know how I talked about the symbolism of the bird and the pocket watch earlier in this post? Well, turns out that the creators of this story got even deeper than symbolism. In fact, from the opening scenes of this movie, you already have everything you need to know in order to understand the story. When I watched this movie last, I paid specific attention to these symbols. Now, I’m getting a little geeky here because this is something I get really excited about, but bear with me. Here’s a list of some of the most important visual symbols and characters seen in this movie – the train and train tracks, the pocket watch, the bird, the silver, the Comanche, Latham Cole, Butch Cavendish, Red Harrington (the woman with the wooden gun-leg), Rebecca and Danny Reid, and Captain Jay Fuller. In the first ten minutes of the movie after Ancient Tonto starts his story, every one of these people and visual cues appear, one after another. Watch this Youtube clip for some illustration (the person who posted it doesn’t allow embedding) – it skips bits but you should be able to catch most of the cues. Everything you need – in one scene – right from the very beginning. The directors are literally giving you the plot but it’s so subtle and well-done that you only notice on the rewatch. This is professional, literary, genius-level writing right here, and is something that every good story has in common – it’s so deep and symbolic that you get more out of it each time you approach it again. This is my absolute favorite part of the entire movie. Not only is the camerawork and acting and execution of this whole scene so fun to watch, it wraps up the story perfectly, and the music, oh, my gosh, the music. I’ve noticed every single time I’ve watched this movie that the music is perfect. Everything lines up so exactly it almost seems like the picture was cut to the music and not the other way round. I found a video on YouTube that explains my excitement over this scene way better than I can, so I thought I’d put it in here for you to watch. This video points out everything I wanted to point out about this scene, and also includes a little more about the camerawork that I didn’t know before I watched it. Also, it told me something score-related that I hadn’t known – namely, that Geoff Zanelli (who worked on POTC and scored the last one) was in charge of arranging the William Tell Overture for this scene using Hans Zimmer’s themes. I had always assumed it was Zimmer but Zanelli did such a fantastic job I can’t help but admire his skill at this. My ultimate life goal right here, ladies and gentlemen! Well, there you go – that’s my seven reasons you should watch The Lone Ranger. Please watch the video above – it may be a little long but it’s worth it, I promise. And don’t forget to comment below with any questions or comments you may have! It’s time to talk about it. I apologize that it has taken me so long to write this post – I’ve had a lot of life stuff and basic procrastination in the way. I will cover major fan theories and Avengers 4 rumors in a future post once I have more time. It’s been plenty of time since Avengers: Infinity War came out, and you’ve had more than enough time to watch the movie. So I’m going to go ahead and dive right into what happened in the movie, including BIG GIANT SPOILERS (don’t say I didn’t warn you), breakdowns, and some of the major new fan theories that have been popping up on social media. This review is meant for those readers already familiar with the Marvel Universe, so I will not be introducing characters or explaining their backstories, unless I’m specifically drawing attention to them. If you are only a casual fan or haven’t seen all the movies, heads up, this might be a little too geeky for you. Here we go. If you’ve read this far and haven’t seen the movie, you have no one but yourself to blame. Here’s a summary of the movie, in case you were in denial and trying to forget – Thanos has been on the hunt for the six Infinity Stones – power (purple), space (blue), reality (red), soul (orange), time (green), and mind (yellow). His goal is to use them in his newly created Infinity Gauntlet to wipe out half the universe in order to balance out the remaining population and create peace and prosperity. Throughout the course of the movie, he obtains each of these stones, leaving our beloved characters dead in his wake as they try to stop him. At the beginning, he has already been to Xandar and collected the Power stone. Then he encounters Thor’s ship and takes the Tesseract (Space stone) from Loki, killing him and Heimdall in the process. He then collects the Reality stone from Knowhere, killing the Collector, and kidnapping Gamora, who has come with Drax and Mantis to stop him. She takes him to Vormir, where he kills her in order to win the Soul stone, then travels to his home planet, Titan, to get the Time stone from Doctor Strange, who ended up there with Tony, Peter Parker, Peter Quill, Mantis, and Drax. He is almost defeated by the six of them, when Nebula shows up and demands to know where Gamora is. When Quill finds out Gamora is dead, he punches Thanos and they lose their chance of taking the Gauntlet. Strange eventually gives up the Time stone in exchange for Tony’s life, and Thanos travels to Earth to collect the Mind stone, which is embedded in Vision’s forehead. Thanos and the Black Order attack Wakanda, which is defended by Cap, Bucky, T’Challa, Black Widow, Okoye, M’Baku, Falcon, Rhodey, and later Groot, and Rocket, and Thor (who’s wielding a cool new battle-axe he got in Nidavellir), while Wanda protects Vision as Shuri tries to separate him from the stone without killing him. But Wanda ends up having to destroy the stone while it’s still in Vision’s forehead, succeeding and killing him just as she can’t withstand Thanos any longer. Thanos uses the TIme stone to reverse time and take the stone anyway. He snaps his fingers and wipes out half of all existence despite having Thor’s battle-axe in his chest. Half of all the remaining Avengers crumble to dust, and Thanos retires to a secluded place to watch the sunset. In the post-credits scene, Agent Hill and Nick Fury also crumble, but not before Fury sends an SOS to Captain Marvel. Whew! This movie was packed! You should have seen how long my first draft of this summary was! All right, let’s dive in and see how much sense we can make of this thing. First off – I CAN’T BELIEVE HOW MANY PEOPLE DIED!!!! Before the snap: Heimdall, Loki, The Collector, Gamora, and Vision. After the snap: Bucky, T’Challa, Sam, Groot, Wanda, Drax, Mantis, Peter Quill, Doctor Strange, Peter Parker, Agent Hill, and Nick Fury. Just looking at that list makes me want to cry. But the directors let us know that we should pay more attention to who survived when it comes to theorizing about the next movie- so let’s also take a look at that list: We still have all six original Avengers (unless Hawkeye didn’t make it, which is unlikely, but more on that later) plus Rhodey, Rocket, Nebula, Okoye, and M’Baku. We can also probably safely assume for the moment that Shuri and Wong are still alive, since they were not shown after the snap. Ant-Man survived (spoiler alert for Ant-Man and the Wasp) but in the end credits scene it is revealed that neither Hope van Dyne (Wasp) or Hank Pym did. Of the six sacrifices in this movie, three are made one direction, three in the other (hmm, perfectly balanced. Coincidence? I think not!). Loki, Doctor Strange, and Vision choose to protect the individual (Thor, Tony, and Cap respectively) to the detriment of the universe, and Quill, Thanos, and Wanda decide the universe is more important, and sacrifice the individual (Gamora, Gamora, and Vision, respectively). Poor Gamora. Going into the theater when I first went to see the movie on April 26th, I was excited to see my favorite Avenger with a whole new look and story – Hawkeye. But the further the movie progressed, the more confused I got. Where was he? When he didn’t show up by the post credits scene, I was definitely bewildered, disappointed, and most of all worried. I had looked it up before the showing. Jeremy Renner was listed in the cast. I’d been seeing set pictures of him sporting a cool new mohawk. And yet, I had been deceived. My guess is that IMDB just put everyone in the cast list so that no one would be able to guess what would happen. And I’m betting that the list for Avengers 4 is doing the same thing. If Hawkeye wasn’t in this movie, what’s going to happen to him in Avengers 4? The directors have confirmed that characters who got less screen time in IW will get more in Avengers 4, and the characters that got more screen time will be in the background. This means, in my estimation, that characters like Gamora, Banner, and Thor will fade a little while other characters like Hawkeye, Ant-Man, Wasp, and Captain America will get more attention. Right now, the “Untitled Avengers Movie” cast list on IMDB includes characters that are supposed to be dead but I’m less inclined to believe them this time around. I’ve got a couple of theories (and worrying premonitions) about Hawkeye, but because they’re theories, they’ll have to wait until the next post. But suffice it to say, my favorite Avenger had better get some good action in the next movie because I totally thought he was going to be in Infinity War. There was a bunch more I was going to say on this movie, but I’ve already procrastinated enough on getting this out. So let’s take a final look at what happened in this movie that will probably affect A4. I will also be including information from Ant-Man and the Wasp since you should have had enough time to see that movie, too, by now. (If you haven’t yet, go watch it, then come back and read this part). I’ll also mention some theories at what will happen in Captain Marvel, which comes out next March, that also might affect the fourth Avengers movie. One of the best ways to finish a story is by bringing it back to where it all started. Where did it all start? The Avengers. That’s what Infinity War has been teasing, even from the first trailer: “There was an idea….”. Having all six original Avengers left is very telling, especially given Strange’s sudden willingness to save Tony’s life at the cost of the time stone. Remember, this is the guy who just saw 4 million different futures. Something he saw told him that Tony was too important to die then on Titan. I totally expected Tony and/or Steve to die in this movie, but there is obviously a reason they are both still alive. Their character arcs are finished – all they have left to do is complete their story. That means that the Russos have a conscious plan for their characters and whatever it is they will do in the next movie will complete their stories once and for all. Well, that’s the end of this exorbitantly long blog post that said a ton and not much at the same time. I hope to write a future post detailing some of the theories regarding Infinity War, Avengers 4, and Captain Marvel, which could be a whole series in itself. I might even write separate posts for each one. I mean, with the “Hulk Was Actually Loki in Disguise” theory, the time travel theory for A4, and the introduction of the Skrulls, it could be a really long discussion. But it’s one I’m excited to have in the future, and I hope you’ll enjoy it with me! If you missed the first part of my post, Avengers: Infinity War Part 1 (NO SPOILERS), go ahead and read that now. I’m a HUGE Marvel fan, so much so that my family members (who are also fans) tease me about it. And last Thursday I got to finally watch Avengers: Infinity War! My family usually goes together to see Marvel movies, but this time I got a text from a friend saying that there was a group of grads from my homeschool group going to see it together. Of course I said yes, especially since the 26th was at least a day earlier than I had planned on seeing it, depending on when my family had time to go. The entire 10 years of the Marvel Cinematic Universe has culminated in this moment, and though I’m not going to spoil anything in this post since it’s been less than two weeks since the movie came out, I just wanted to share some of my biggest feelings and hopes that I had regarding this movie before I saw it. First of all, I wanted to see it as soon as possible. There was no way I was going to let social media spoil it for me (I saw my first spoiler post today on Pinterest, as a matter of fact, and I was so glad I’d seen the movie), and I didn’t want to have to stay off the Internet altogether if it was going to be a while before I’d seen it. I also was (like I mentioned already) really, really pumped! I mean, nothing like this has ever been done in the history of movies before. It’s such a big crossover! I have seen all the movies anywhere between one and two dozen times, except for Spiderman: Homecoming, and can practically quote some of them. I’ve grown very attached to most of the characters, and was constantly reading and coming up with theories of my own about what the Russo brothers were going to do with the movie. But, judging from how amazing Captain America: The Winter Soldier and Captain America: Civil War turned out, I wasn’t really worried that the movie would be terrible. I was worried about the characters, obviously. I have definitely have favorite characters, and I don’t want to see anything happen to them. But I also like to try to see movies from a storyteller’s point of view as well. So imagine seeing the story from both sides, both as a fan (“I really hope they don’t kill off this character! The universe wouldn’t be the same without him/her!”), and as a writer (“Hmm, this character’s story arc is just about complete. The best ending for this character would be to _______ and then probably die.”). Like I said, I’m not giving away any spoilers in this post, but some of my theories turned out to be correct and others were way off mark. There were some things that were totally unexpected and had never even crossed my mind. And finally, I was super impressed with the hype. The marketing was done so well! Every time I turned around, at least on my social media, there was a new poster, or a new trailer, or a new TV spot. By keeping the movie and what could possibly happen so public and yet so under wraps (no spoilers, Tom Holland and Mark Ruffalo! ), it really kept people talking about it and wondering what was going to happen. Overall, my general impression of the movie itself was that I probably shouldn’t make a decision yet – I need to wait for Avengers 4 before I can make a final judgement on what I really thought of it. But Marvel already has an A+ in market strategy, in my opinion. Avengers: Infinity War cup! I’m going to take it to college with me and use it for popcorn. I will post again in a few weeks with a full-breakdown review – spoilers and everything – about my most and least favorite moments in Avengers: Infinity War. Make sure you see it before then! On a side note, what kind of a fan are you? Do you try and research everything you can about a movie beforehand – promos, clips, fan theories, because it increases the anticipation for you? Or do you try to stay away from anything related to the movie because you don’t want to have the experience ruined by possible spoilers? I’m of the first opinion – in my mind, the anticipation before the event is half the fun! I always try to make the most of the wait, so even if I’m disappointed in the movie, I at least enjoyed something. Comment below and tell me which one you are!